After responding to a couple inquiries from reporters about the game-day experience in Morgantown, I decided to share my insights here for all the opposing team fans who plan to make their first trip to Touchdown City. Here are my tips for fans who are traveling to Morgantown for college football. What is the atmosphere like on game day in Morgantown? The atmosphere is loud, festive and blissful. On game day, Morgantown becomes the largest city in West Virginia. People travel from all over the state and the country for WVU football games. 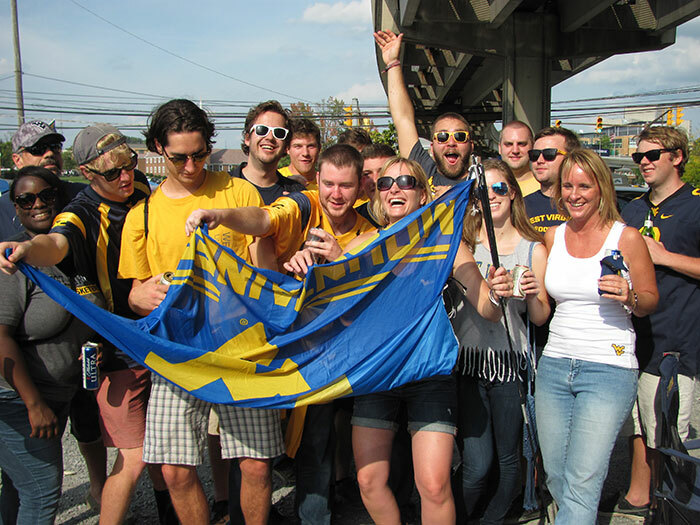 Last year, we even met 2 guys who drove from New Hampshire and Massachusetts just to experience WVU game day. They had no ties to the university or the state. And Mountaineer fans are eager to welcome fans from opposing teams and introduce them to the Mountaineer Magic. 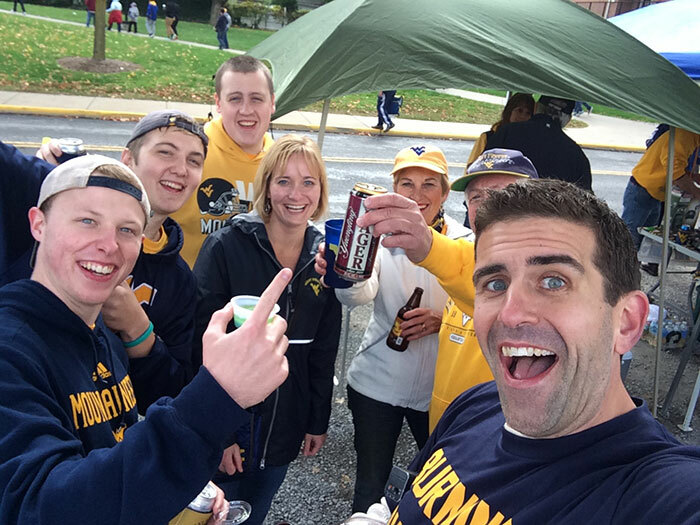 Nick Stevens, host and producer of the CBS Sports’ Tailgate Fan Show, suggested “we bottle ‘Mountaineer Pride’ and sell it as an anti-depressant” after he experienced WVU game day in 2014. The visceral pride of Mountaineer fans is so palpable you can see it, taste it and feel it. You don’t have to take my word for it, either. Kansas State, Oklahoma State, Texas Tech and Texas fans have all shared their experiences with me. 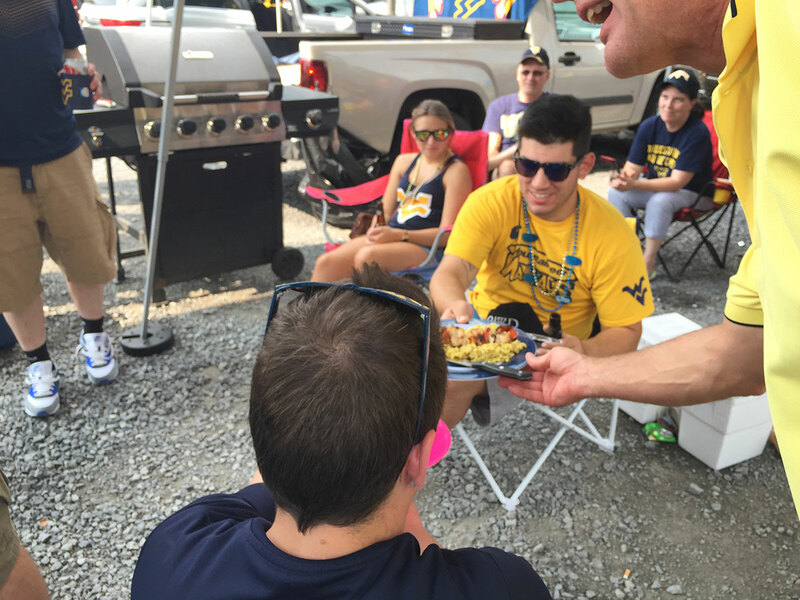 What specialty food and drink items can you expect at a WVU tailgate? Moonshine and pepperoni rolls are what West Virginia fans are most known for, but Dave and I are known for fueling our tailgates with gourmet food and craft beer. I also created a signature Mountaineer Margarita that I bring from time to time. 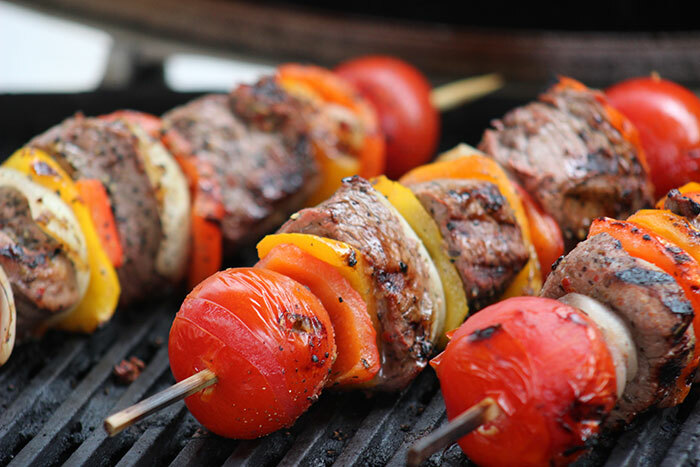 My favorite dish is Dave’s filet kabobs over a bed of wild rice. He begins marinating them the Thursday before game day. We also try to have a healthier tailgate. We’ll have Way Better Snacks with salsa and guacamole, low-sodium turkey vegetable soup, chickpea salad with honey garlic lime vinaigrette and cabbage salad. What should someone coming for the first time know about tailgating – where should they go, what time do they need to get there? Come early, stay late. 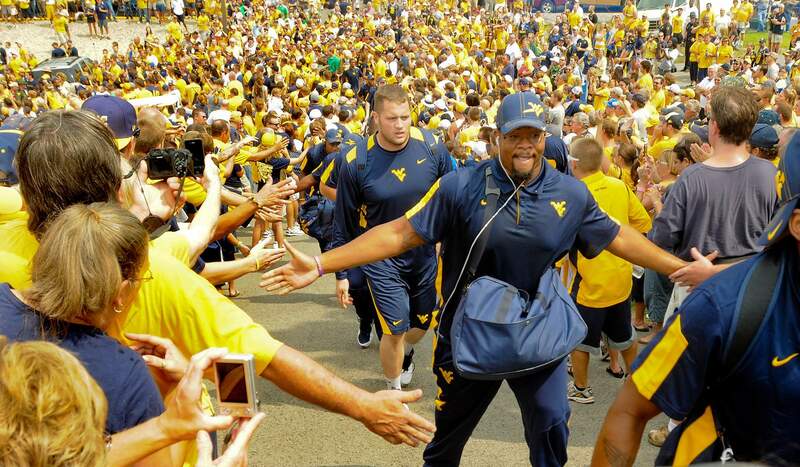 Walk around and experience the Mountaineer Magic of game day. WVU fans love to share their tailgates. We have a saying, “If I have food, you have food. If I have drink, you have drink.” You never have to worry about feeling welcomed. 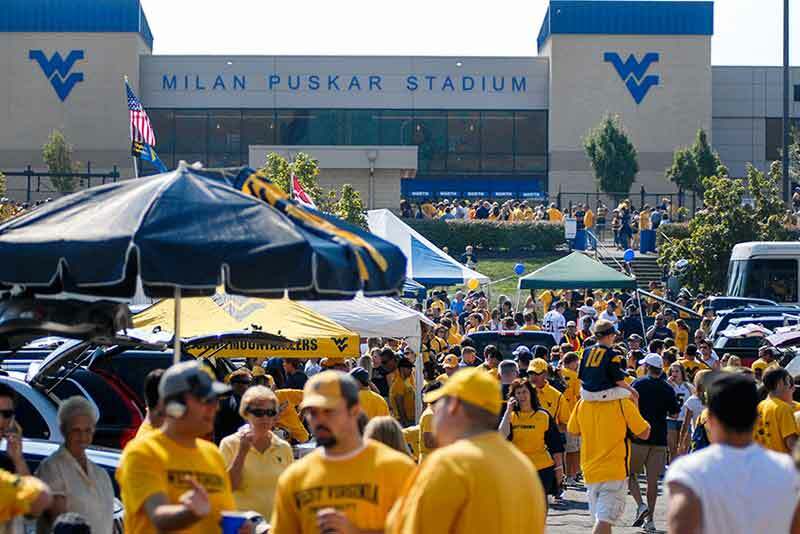 The tailgating lots closest to Mountaineer Field require season parking passes. However, there are plenty of lots that allow single-game passes, like the gold lot, which is where we tailgate. It costs $20 per game. But don’t buy it ahead of time because there’s a $10 handling fee. Just make sure to get there early enough the day of the game. WVU offers information about game-day parking. Also, WVU sells beer inside the stadium and once you’re inside, you can’t leave and re-enter. What tips do you have for football fans coming to visit? Any must see or must try places or food? I recommend the Rail Trail along the Monongahela River for walking, running and cycling. (Wamsley Cycles offers bike rentals.) You can also hike the Core Arboretum, which is located next to the WVU Coliseum. It has 3 miles of hilly foot trails. If you have a car, it’s worth driving out to Coopers Rock State Forest. 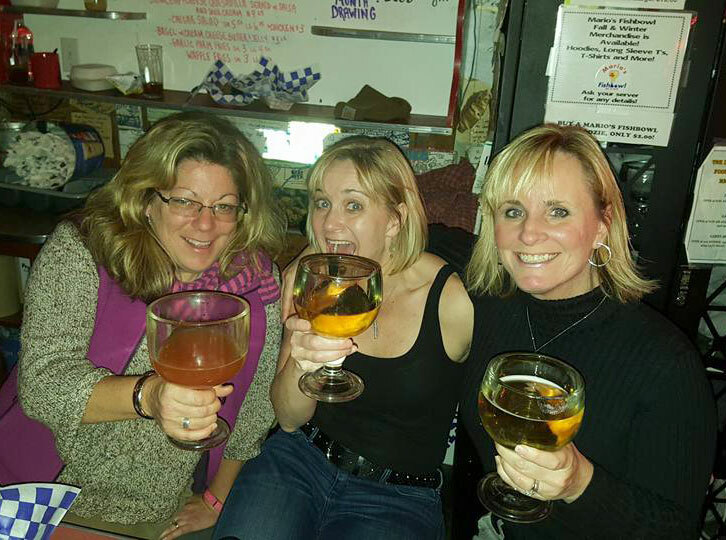 The most popular hangout is the original Mario’s Fishbowl on Richwood Avenue. The iconic bar is the perfect place to pregame the night before. 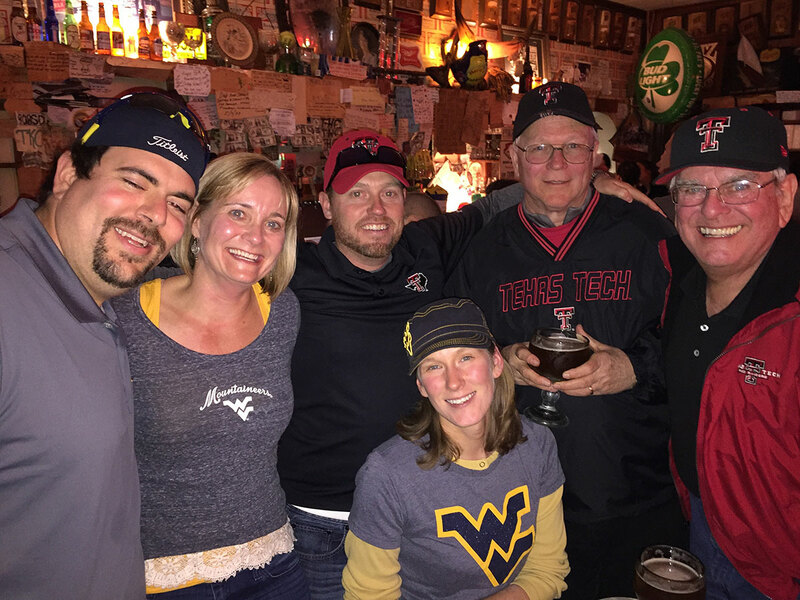 You’ll find the friendliest and most mirthful folks you’ll ever meet and get a taste of what West Virginia fandom is all about. In addition to Mario’s Fishbowl, I recommend Black Bear Burritos for a delicious taste of Appalachia as well as Mountain State Brewing Co. 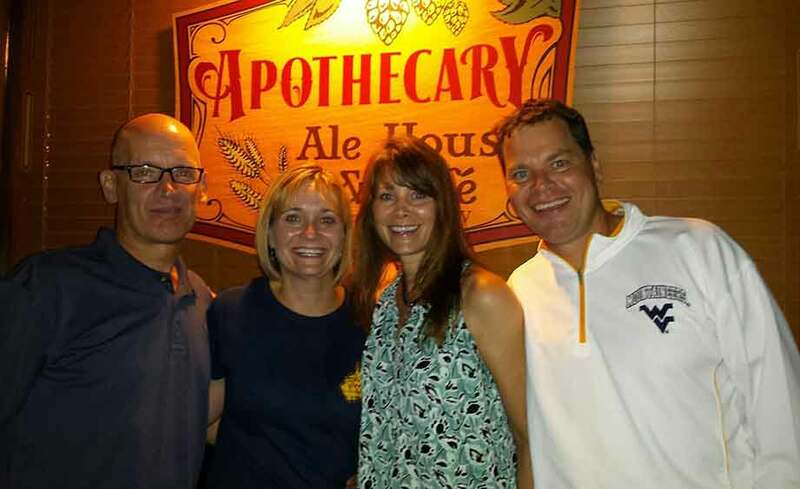 If you prefer a nice Italian meal, Oliverio’s Ristorante is a good choice and it’s adjacent to Mountain State Brewing Co.
Apothecary Ale House is an excellent place to hit up for a great craft brew selection and throw-back games. My friend Harry Grandon also suggests Iron Horse Tavern, Tin 202 and Montmartre Restaurant on High Street. Kegler’s near the stadium is also a popular place to eat, drink and watch games on the big-screen TVs. What are the best places to stay while in town? There are also hotels closer to the stadium. 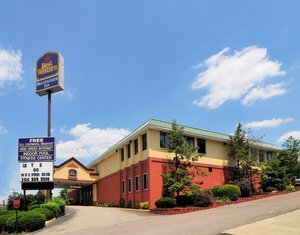 Downtown Morgantown also has some nice hotels that will give you a better taste of student nightlife. If there’s availability, the Chestnut Boutique Hotel is beautiful and the rooms are spacious. The historic Hotel Morgan on High Street and the Waterfront Place Hotel in the Wharf District are also popular places to stay. Morgantown has a small airport but Pittsburgh has the closest major airport. It’s about a 60-75 minute drive to Morgantown. What are some big WVU football traditions? 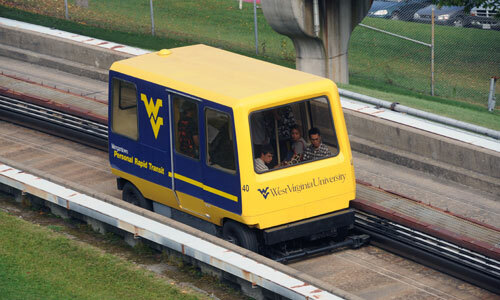 The Mountaineer Mantrip is a 300-yard team walk designed to rally WVU fans about 2 ½ hours before kick-off. Players, coaches, cheerleaders and members of the Pride of West Virginia marching band make their way to the stadium amidst cheering fans, and as they enter the gate the players stop to rub a 350-lb. chunk of coal for good luck. This tradition honors West Virginia’s coal mining heritage. “Take Me Home Country Roads” is a rich part of Mountaineer football tradition. 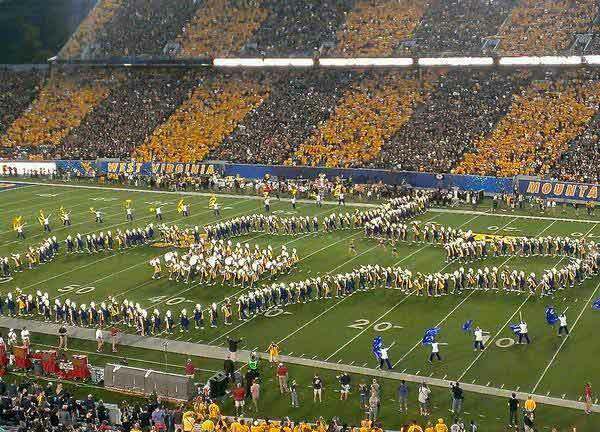 The Pride of West Virginia marching band performs it at every game, and when they do, they march end zone to end zone in the formation of the state’s borders. Fans also sing it in the stadium after a win. A USA Today article listed this as one of the 10 best traditions in college football. 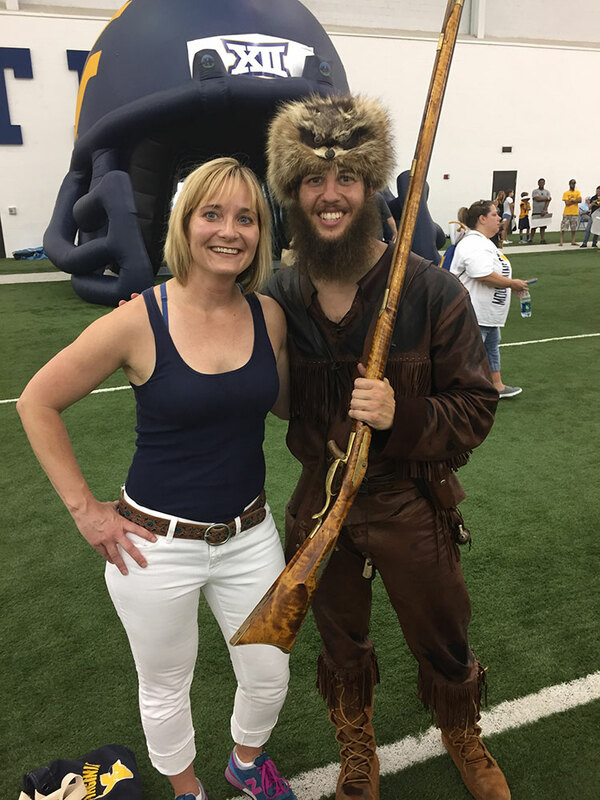 The Mountaineer Mascot is one of the most beloved of all West Virginia athletic traditions. In fact, the Mountaineer was recently named the best mascot in the Big 12 by ESPN. “Let’s Bring on the Mountaineers” is another great tradition, signaling the football team’s entrance onto the field. After the Mountaineer fires off his musket, he and the cheerleaders lead the team out onto the field through a shroud of smoke. Coming in from Canada for the wvu vs tcu game in October. The 4 of us go to a different college every year for a game and this year coming down to see your team beat tcu. We are driving down and want to tailgate and looking for any info you can give me. Where to park/tailgate, what time. Hi, Steve. That’s awesome. Where in Canada? My daughter is a graduate student and TA at the University of Waterloo. The game time hasn’t been set yet, but I encourage you to come early and to stop by our tailgate. We’re always under the PRT. We are doing the same thing coming from Syrause, Rochester and Buffalo NY! Got a gold lot pass and staying at Hotel M down the way. Our plan was to drive over early, walk back to hotel or get breakfast, then come back and tailgate (cametime will determine timeline of course). Is the Kroger nearby walkable from the gold lot if we need to get ice/extra supplies? Also, can we leave our car overnight and come get it the next day so we don’t have to worry about having a DD? Look out for them New York boys, we’ll be bringing our finest chicken wings and Labatt Blue Lights! Hi, Peter. The gold lot is behind Kroger so it’s a very close walk. You can’t leave your car overnight, but you can easily walk to the gold lot from Hotel M. Have you been to a WVU game before? I went to one in 2009 against Louisville. We didn’t have a tailgate to go to so we just carried an 18-pack and pepperoni rolls and sat in the grass by the stadium. It was also a noon game so not exactly the full experience, this time we are trying to do it up right with a full tailgate so we wanted to drive. However, we all like to drink so we were hoping we could drive there, leave our car overnight then walk and get it the next day so no one has to drive after the game. We may just have to plan a DD if we can’t leave it overnight. Yeah, I hate those noon games. I don’t blame you for wanting to fully embrace the tailgating experience so I recommend someone in your group refrains from drinking during the game (I always take about 4 bottles of water into the stadium) and then you’ll be OK to drive your car back to the hotel. Morgantown now has Uber so you can get around to enjoy the night life without worrying about a DD. Hey my teenage daughter and I are coming from Virginia for the TCU game. I’m an alum from TCU. We are staying in Berkeley Springs and driving to Morgantown the day if the game and meeting friends from Texas. On many if these posts it says not to wear your team colors. Is that true??? I can’t imagine that people would be unwelcoming. Also I can’t walk far and don’t mind paying extra to park close. Do you have any suggestions. Thanks!!!! Hi, Deborah. I’m surprised that you’ve read posts that discourage opposing teams from wearing their school colors. That isn’t true at all. We welcome all fans. In fact, we like it when fans travel for their team and even had a few K-State fans at our tailgate this past weekend. For parking, your best bet may be to park at the Coliseum if you can’t walk far. Then you can take a shuttle to the stadium. The parking is free at the Coliseum, but it is on a first come, first served basis. Here’s a game day guide for parking at the Coliseum: http://www.tourmorgantown.com/downloadz/WVU_GamedayGuide.pdf We always park in the gold lot but it’s almost a mile from the stadium. Thanks so much. If we can get there early enough can we swing by where you are tailgating. It would be nice to see a friendly face!!!! Absolutely! You’re more than welcome to stop by. We’re always under the PRT in the gold lot. My wife is a WVU grad. I am a Nebraska Cornhusker. She has gone to games in Lincoln with me now it is my turn to come to Morgantown. I am greatly looking forward to this. Surprised her with Row 1 seats in Section 126 for the Oklahoma game Nov. 19th. Now the most important stuff! Your tradition for tailgating at WVU is legendary. So is your website here. Since we are flying into Morgantown, know absolutely no one else going to the game, I am looking to find a tailgate party(s) we can join there for the pregame celebration. Insist upon helping pay for the privilege and/or bringing whatever we can carry from our hotel. Just looking to round out the weekend in traditional Mountaineer fashion for her. If you have any suggestions for who we might contact to arrange for this to happen I would greatly appreciative for the help. Please let me know. THANK YOU!! Andrea….thank you so much! I think I am actually more excited than she is! Oklahoma is Nebraska’s oldest arch rival. And on this same day the Huskers will be giving Maryland a warm welcome to the Big 10 in Lincoln. So I think we will all get along just fine. Looking forward to it already. Thank you so much again. Will be in touch closer to the date. Hi Andrea! Who would have thought this game was going to be this epic back in September! And they are talking 70 degrees out! 8 pm kickoff though will get a little cool! Just wanted to confirm that we are still welcome to hang out and pre-game party with you guys. Flying in and not having a rental car we are going to be limited to what we can bring. Hopefully we can compensate you or others for their hospitality. We do plan to be at the Fishbowl Friday afternoon and evening. Will you be there? Be great to meet then so we know who to look for on Saturday. Please let us know. My cell is (308) 249-1128 if you want to shoot us a text or call. Nebraska hosts Maryland that same day in Lincoln and kickoff is 1:00 pm so that game will be well over by late afternoon. Hopefully we have a dual reason to celebrate! Looking forward to this day greatly. Thanks again. See you soon. Did not get the email but no worries. We will be at the Fishbowl on Richwood for sure Friday afternoon and evening. See you then! Thanks again! Hi All!! I will be attending my first WVU game against the Baylor Bears in December. I lived in Morgantown for a few years but never made it to a game. My husband has gone to several, and we are bringing our two kids 15, and 9. This is a surprise for my husband. Any tips on where to go for tailgating? Should I try to get a parking pass for the gold lot, or park at the Colosseum and take the bus over? Any advice is appreciated, we are heading up from North Carolina. Hi, Stacy. That’s great! Where are you coming from in North Carolina? I have family in Lumberton. You should park in the gold lot, but don’t order your pass ahead of time. It will cost you an extra $10. Just pay $20 to the gold lot attendant the day of the game. I recommend you get there early so as to get a good spot. And please feel free to stop by our tailgate. December will be a cold one, so we’ll have our heaters going. What time do you suggest to get to the Gold Lot to get a good spot? First time to a WVU game v Kansas on November 5 and we love tailgating! If we don’t buy ahead of time, will the Gold Lot sell out? I recommend you get there between between 8:30-9 a.m. That should give you plenty of time to get a good spot in the gold lot. Hi, what time would you recommend getting to the gold l9t for the Nov. 5th game which is 7p.m.? Hi, Kim. You may want to check with the alumni center. If they can’t help you, then you may just want to walk around the tailgating lots. Mountaineer Nation is very friendly and welcoming as you know. Hello – myself and 3 friends choose a college football game or big event to go to each year and this year it’s Baylor/WVU. we have done Clemson, alabama, Kentucky derby among others. I am driving fromCT and meeting the others in NJ – coming out Friday morning. On Sunday we travel to Pittsburgh for the Giants / Steelers game. Should be a fun weekend. 1. Is it worth it for the extra $50-60 to get touchdown terrace or field box seats? They are going for $100-150 on stub hub now and will likely drop a bit more. 2. We aren’t coming prepared to tailgate due to our travels so can you recommend a pre game bar to hang out at or is there an alumni association or something similar that runs a tailgate – usually they will sell tickets as a fundraiser for $50 or so and it will include food and beer. Thanks in advance for your advice! Looking forward to our trip. Hi Adam. 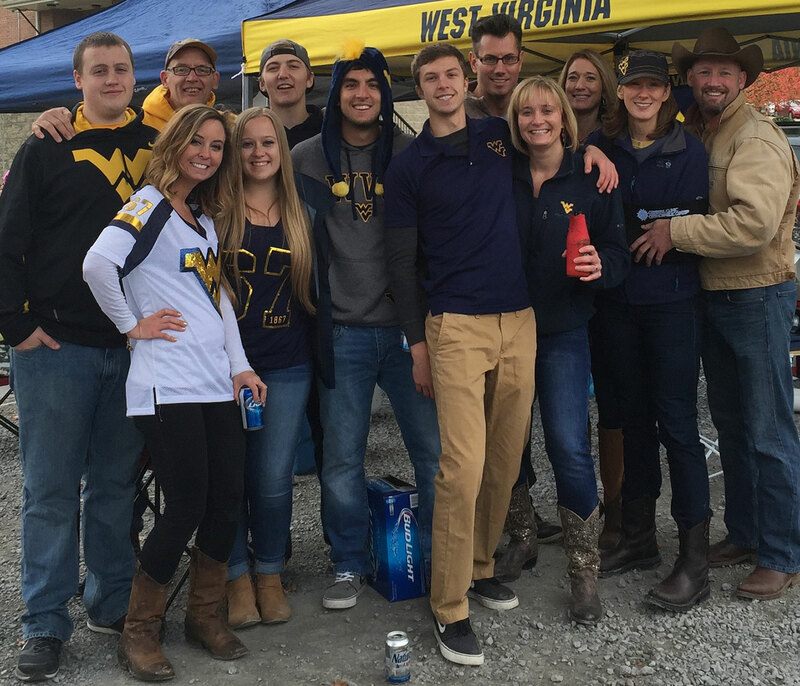 Send me an email to wvutailgating@gmail.com and I’ll let you know about hooking up with a tailgate. In terms of TD Terrace seats, we’ve watched a game there once. It was nice but I don’t know that it’s worth the extra money. Friends gave us free tickets to it or we wouldn’t have been there. The field box seats are very nice and probably worth the extra money. They were recently upgraded and I believe they have seat warmers and heaters in addition to new TVs. What can you put into the new plastic bags that they give you to carry in? Hi, Rose. Sorry I’m late to respond. I don’t know that there’s a limit on what you put in there as long as it fits in the clear bag. I put my clutch bag, my phone and portable charger and bottled water in mine.